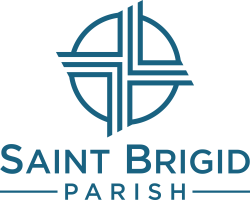 As our patroness, St. Brigid, is at the heart of our parish. She exemplifies the concept of weaving together our diverse community into a cohesive tapestry which represents the many blessings experienced through our parish activities and programs. A woman of great faith, St. Brigid is revered for her gentleness, piety, and charity to the poor. She was once called to the bedside of a dying pagan chief to speak to him about God and Christ's love for mankind. To illustrate her point, she picked some of the reeds covering the dirt floor and wove them into a cross, which she then used to help him understand how Christ died. Our church logo reflects a similar cross. 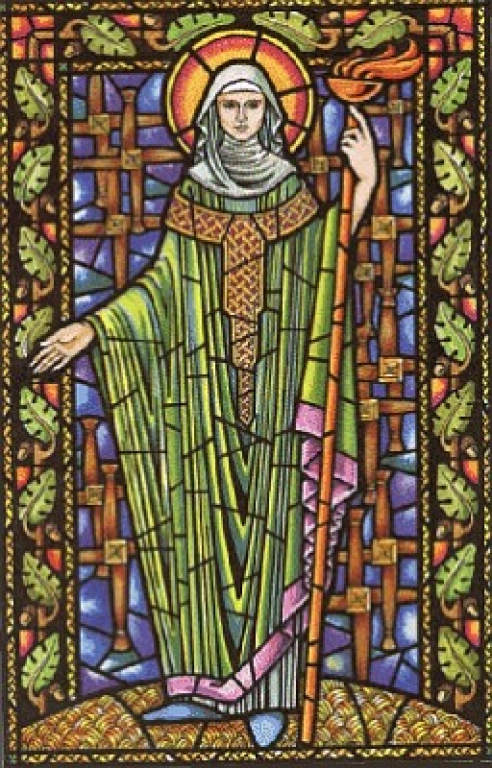 In fact, St. Brigid was one of many holy men and women who continued St. Patrick's tireless work of converting the Celtic pagans after his death. Brigid was raised in the mid-5th century in Faughart, Ireland. Her father was a pagan chief and her mother a slave. At one point, her father wished her to marry the King of Ulster, but she refused and eventually won his permission to become a nun. In time, the king of Lienster recognized Brigid had a beautiful soul and gifted her a large plain in Kildare, Ireland. Brigid built many convents in Ireland, but Kildare was the most famous for housing both monks and nuns. She is patron saint of Ireland, newborn babies, midwives, Irish nuns, dairymaids and cattle. As a child, St. Brigid herded sheep, pigs, and cattle and grew to love animals; she is frequently pictured with a cow. (See the statue of the saint in the church's entrance). As abbess, St. Brigid ranked above the abbot who governed the monks; that’s why she’s often shown carrying a bishop's hooked staff (as in our statue). Some early accounts state that Brigid was consecrated a bishop by St. Mel. She was named after Brigit (or Brigantia), an ancient Celtic goddess of poetry, crafts, prophecy, and divination. Test your knowledge of St. Brigid with this quiz.